In a previous blog, I reviewed the many ways dark matter manifests itself through gravitational effects. But to this day, nobody has managed an unambiguous direct observation of dark matter. This is not surprising given we are talking about a completely different and totally unknown type of matter, something not made of quarks and leptons like all visible matter (humans, planets, stars and galaxies). Nevertheless, just as the quarks and leptons are the building blocks of visible matter, physicists expect dark matter is also made of fundamental particles, albeit dark particles. So we need to catch dark matter particles interacting in some way with particles of regular matter. So far, all we know is that dark matter reacts to gravitation but not to electromagnetism since it does not emit any light. Maybe it interacts with ordinary matter through the weak nuclear force, the one responsible for radioactive decays. Dark matter would then be made of weakly interacting particles. One popular hypothesis is that dark matter particles would be WIMPs, which stands for Weakly Interacting Massive Particles. How often can WIMPs interact with matter? It should be less than 0.1 times per year per kilogram of sensitive material in the detector, depending on the WIMP mass. The detection principle is simple: once in a while, a WIMP will strike a nucleus in one of the detector’s atoms, which will recoil and induce a small recordable vibration. From Lauren Hsu’s review talk at ICHEP 2012. The vertical axis shows the number of times a dark particle transfer a given amount of energy to a nucleus. The more massive the detector and the longer you operate it, the higher are the chances of recording a collision. 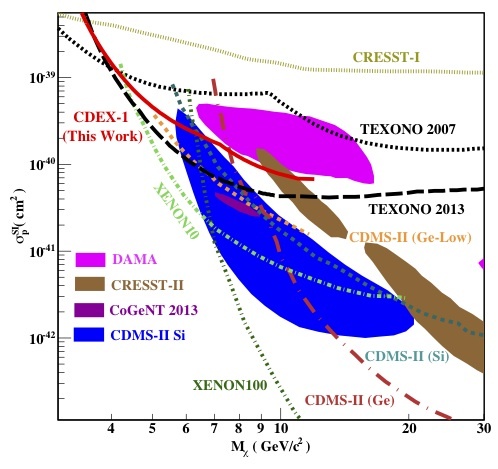 The detector material also matters as seen on the plot above: collisions are more energetic, hence easier to detect, with Germanium (Ge) than with heavier nuclei like Xenon (Xe), but the total number of collisions is higher with the latter material. These detectors are placed deep in mines or tunnels to block cosmic rays that would induce false signals in the detector. Eliminating all sources of background is the biggest challenge facing these experiments. If the Universe is full of dark matter, we on Earth should feel a wind of dark particles as we travel around the Sun. This rate is evaluated to be of the order of a million particles per square centimetre per second for a WIMP ten times heavier than a proton. And just like a cyclist riding on a circular track on a windy day, we should feel a head wind of dark matter particles in June and a tail wind in December since there is a greater concentration of dark matter in the centre of the galaxy. Imagine now a detector operating on Earth and sensitive to WIMPs. The variations in the wind intensity would be detected as an annual modulation in the number of dark matter particles hitting the detector throughout the year. This is exactly what the DAMA/LIBRA experiment claims to observe for more than a decade now as shown on the plot below. Their signal is loud and clear (8.9 sigma) but unfortunately, refuted by several experiments. Three other experiments have also reported signals: CoGent sees a faint modulation while both CRESST and CDMS observed a few events in excess of the expected background. All would be great if these four experiments would all agree on the characteristics of the dark matter particle but that is unfortunately not the case. Many theorists have deployed heroic efforts to devise new models to explain why some experiments see a signal while others do not, but no model is widely accepted yet. The situation remains terribly confusing as can be appreciated from the plot below. The vertical axis represents the possible rate at which a dark matter particle could interact with regular matter while the horizontal axis gives the mass of the hypothetical dark particle. The areas in solid colours delimit the possible values obtained by the four experiments having a signal. Only CoGent and CDMS agree. The lines show the limits placed on the allowed dark matter interaction rate and mass by some of the experiments that reported no signal. All values above those lines are excluded, meaning the null experiments are in direct contradiction with the four groups that reported a signal. As frustrating as this might seen, it is in fact not surprising given the complexity of these experiments. It could be due to experimental flaws or there might be a theoretical explanation. Many experiments are collecting more data and new ones are being built. With theorists and experimentalists being hard at work, hopefully there will soon be a breakthrough. Stay tune for the next blog for a review of astronomical experiments. 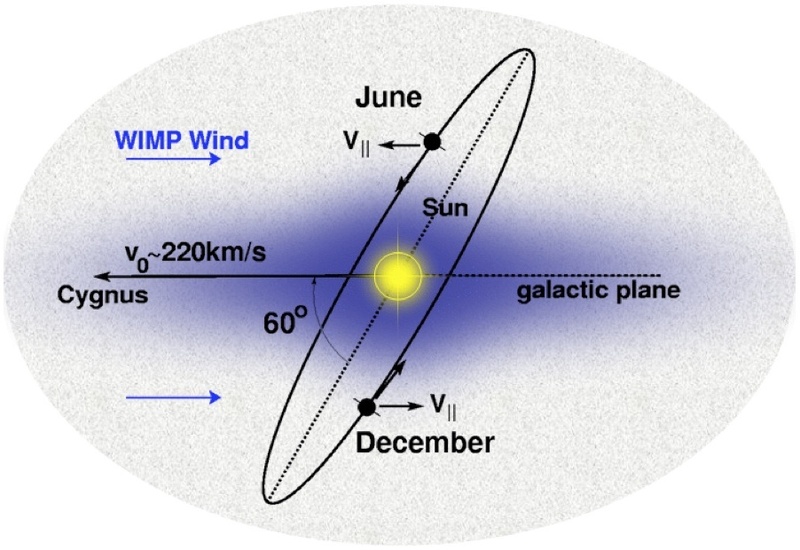 Correction: “we should feel a head wind of dark matter particles during the summer months and a tail wind during the winter” … if we live in the northern hemisphere. Good point! Thank you for correcting me on this. I will modify the text. At present condition, it is true that little more impact seen in Xe than Ge/Si [here interaction with Nucleus taken, not Atom]. It is also true that DM is more near the GALAXY & …., but what about other places? DA,DM are not far away to feel & their interactions with Baryon is not too complicated to understand.Is only air comes out when we fill water in empty bottle? of course, it is hard to say we know how to look for dark matter. Nobody know yet if and how it may interact with matter. So we test many hypotheses. Dark matter is also seen to be concentrated in galaxy centres so indeed, it is a good place to look. Outside a galaxy centre, the density of dark matter is much reduced. For example, in our Solar system, far away from the galaxy center, the quantity of dark matter within the Solar system amounts to 0.0000000000001 times the mass of the sun. So yes, when you fill up a bottle, it is essentially just air coming out. There is very little dark matter here to start plus it permeates regular matter anyway. Tnx. for such a quick response. It means our immediate surrounding [invisible part] contain only air? Then what about SUPERSYMMETRY & 96%? pl.refer my comment in above topics. It is true that dark atoms are present everywhere including near the earth. But the sizes of resulting dark matters are smaller near the earth with respect to that found near galactic cores or stars. It is also true that the size of dark matters near equator is little larger than at other places on the earth except inside the earth. Dark atoms are always balancing white atoms to maintain super-symmetry. If we put water in a bottle, both dark atoms & air (white atoms) comes out. White atoms are swimming in the ocean of dark atoms. Dark atoms & dark matters have been continuously adjusting itself in universe. Stars are not the source of dark atoms but they are the warehouse of dark atom.